Today we’re super excited to present our brand-new Knot Free Trio. We’ve worked to offer you the most flattering and natural-looking lash experience, letting you control the level of ‘slay’ you want that day and saving you time along the way! (Call us poets.) With no knots, no band, and stunning tapered-end technology, they’re fast, breezy, and drama free! Whether you’re a strip lash gal, or a sworn individual lash devotee, here’s a product that meets you in the middle. You get the individual lash look but in way less time. Talk about a winning combo! For those of you who are new to the individual lash world (or if it’s your first time using false lashes – WELCOME! 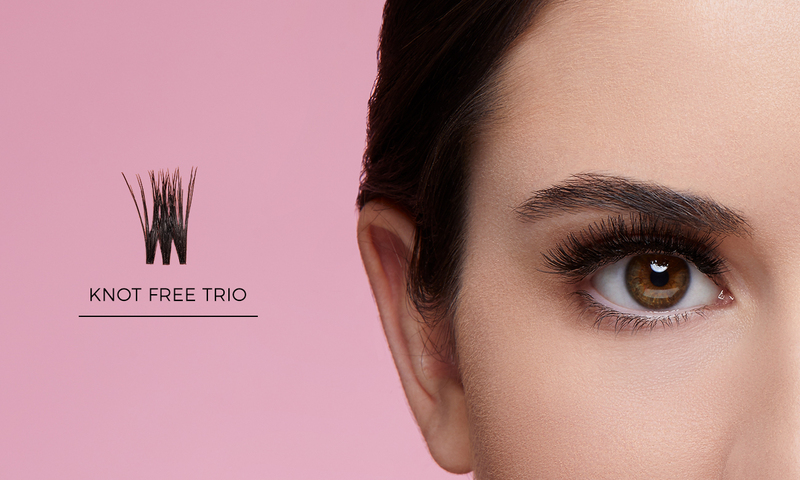 ), we’ve put together a simple how-to vid to help you work your own special magic with our Knot Free Trio lashes. Look! Here it is now!